Passenger car tyres are products of complex engineering. They consist of numerous rubber compounds, many types of carbon black, fillers like silica, and chemicals or minerals. Find out here how tyres are put together. 1. Tread. 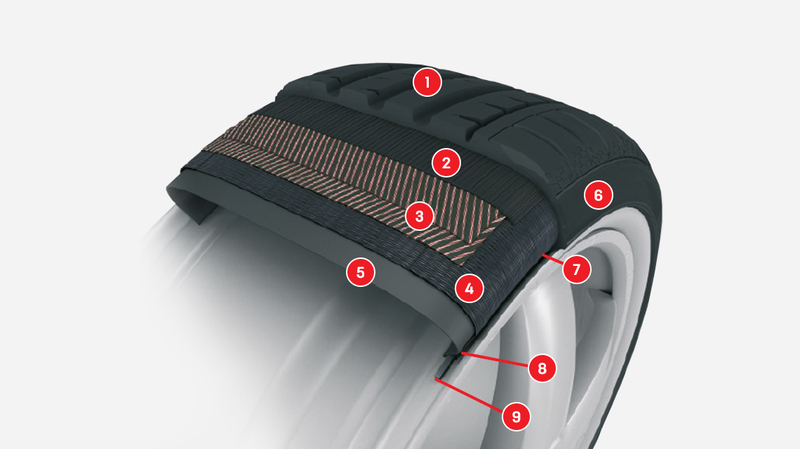 Made from synthetic and natural rubber, it’s comprised of three sections: the “cap”, which is responsible for gripping the road and providing directional stability and wear-and-tear resistance, the “base” which reduces rolling resistance and damage to the casing and the “shoulder” which forms an optimal transition from the tread to the sidewall. 2. Jointless cap plies. Found just underneath the outer layer of the tyre, this nylon cord, embedded in rubber, enhances high-speed suitability. 3. Steel-cord for belt plies. High-strength steel cords that enhance shape retention and directional stability. As well as reducing the rolling resistance they help to increase the tyre’s mileage performance. 4. Textile cord ply. Rayon or rubberized polyester controls the internal pressure and maintain’s the tyre’s shape. 5. The inner liner, made from butyl rubber, seals the air-filled inner chamber and acts as a tube in tubeless tyres. 6. The side wall protects the casing from external damage and atmospheric conditions. Information about the tyre can also be found on the side wall. 7. Bead reinforcement, made from nylon and aramid fibres, enhance directional stability and ensure steering precision. 8. Bead apex. This synthetic, rubber material also enhances directional stability and steering precision while improving comfort. 9. Bead core. This steel wire, embedded in rubber, ensures that the tyre sits firmly on its rim.